SD-WAN has become a vital word in various industries related to IT. 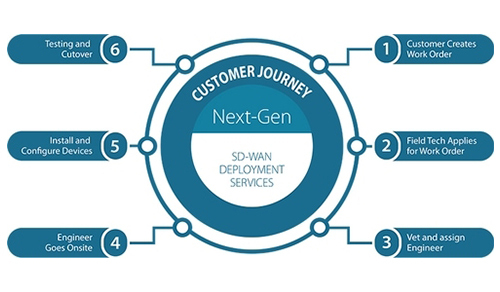 If you have clients in this industry or related to this sector, there’s no doubt, you will have been asked about the deployment of SDWAN routers. Indeed, by 2018, 40% of WAN edge infrastructure was expected to be SD-WAN. It is a way of simplifying enterprise connectivity between remote locations and various branch offices. At Field Engineer, you’ll be able to find experts ready to handle SDWAN routers deployment. Highly trained and professionally qualified, these engineers are nearby and ready to provide SDWAN solutions to your clients. How do we know our service will match your needs? We have 40,000 plus engineers in 180 different countries. We make sure that we only offer the best freelance SDWAN engineers on the market with the right level of training and expertise. We won’t let you down and will make sure that you can offer your customers the best, most efficient and effective solution on the market. As well as being able to find an expert freelance SDWAN engineer in no time, nearby, FieldEngineer provide you with the ultimate simple solution for your needs. Everything from the search to the final payment can be completed through our system. As such, you’ll be able to save both time and money by using our service. Don’t wait, sign up today and within minutes you’ll be able to find an engineer perfectly positioned to handle SD WAN routers deployment for your business. Once you have signed up you’ll immediately be able to start posting work orders and we guarantee, one of the best freelance engineers will answer your query.